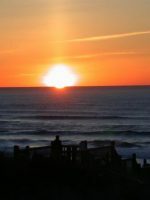 Located on Yaquina Bay, with amazing views of the bridge and the harbor, The Landing offers fully furnished condominiums that are perfect for a larger family, or for those looking for all the comforts of home. All of the units feature a full kitchen, dining area, gas fireplace, washer/dryer and more. Parents will love the private balconies in the non-studio units, where you can watch fishing boats come and go, or just enjoy a beautiful sunset each night. The entire family will appreciate being so close to Newport’s historic bayfront, with easy access to shops, restaurants, and attractions. It’s less than a mile from The Landing to the other end of the bay, and kids will love walking past the working boats, the stacks of crab pots, and the barking sea lions! Other amenities include a fitness center, free Wi-Fi, free newspaper, BBQ area, crab cookers, and full housekeeping. The staff here is VERY friendly and accommodating. They will work with you like no one else I know. 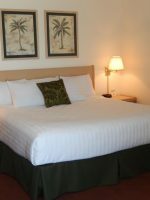 The rooms are very nice with a bay view and very comfortable king size beds. I'll be back. It has a full kitchen and coofee is provided. This is our second stay here and in two different rooms. 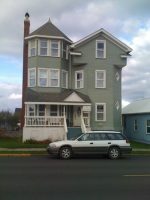 The facility is set to where every room has a view of the Harbor and the Bridge, wonderful sunsets, close to stores and attractions, rooms have a small kitchen with Refrigerator, full Stove, Dishwasher, Microwave, stacked Washer/Dryer unit, Cable TV with a DVD player in the living room, Cable TV in the Bedrooms, bedrooms are really quiet, firm beds. Drawbacks are: The internet connections only work in the living room, Diesel smoke is fairly heavy especially in the Mornings and Evenings from the boats out front and from pickups and heavy truck traffic out front. Overall a nice place to stay, however if you are bothered by diesel smoke then this is not the best place for you.